When a toddler sees something he or she wants and cannot have it immediately, the natural response is to scream. Tantrums usually start around 15 months because that’s the age a young child starts to voice their own desires. Your child simply doesn’t know any other way to communicate the anger and frustration they are feeling. Being hungry, tired, sick, or too excited can trigger a tantrum. 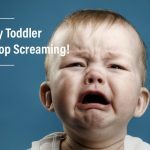 Temper tantrums are completely normal and an important developmental milestone. Ignore the temper tantrum. If possible, go to another room and do not talk to your child until he/she has calmed down. If this doesn’t work, try to distract your child so he/she forgets why he/she was upset. If your child is extremely upset and is hitting and kicking, try using a brief time-out by either holding the child firmly, or putting them into a playpen or other safe area. When the tantrum ends, don’t refer to it. Give your child a big hug and start a new activity. Forgetting about the tantrum is better than discussing it. Help your young child learn the words they need to express the emotions they are feeling. For example, I know you are mad, but we do not kick the television when we are mad. Explain the rules. Tell your child that he cannot get out of the chair until the timer rings. He cannot talk, watch T.V., play with toys, kick the wall, or scream. Put a chair in a boring location. The bottom of the steps can be used if you don’t have a child’s chair. Tell the reason. Your child might not remember what she did wrong. Tell your child, You hit Maria so you are in time-out. Act immediately. If too much time passes, the time-out will not be effective. Do not talk. If your child tries to talk you out of the time-out, ignore the attempt.